Breakthrough name on the art scene SALVATORE PALAZZO sits down for an exclusive interview by our contributor SAV LIOTTA. The two meet up to talk for DESIGN SCENE magazine‘s latest edition about the beginning, the pain in the artist’s life which now serves inspiration, the celebrity culture placed in a form of a religious icon and the future evolution of Saverio’s work. You are a young artist, who to define is rather difficult, your art-works are a mixture of painting, graphics, pop culture and collage. 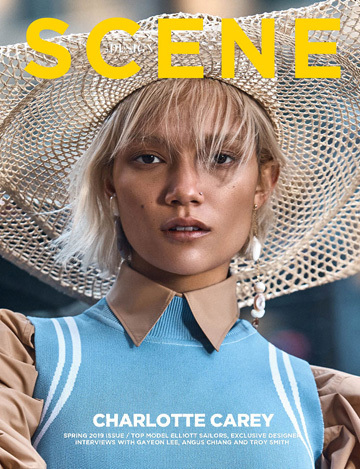 Could you please introduce yourself to DESIGN SCENE readers in your own words? I always like to present myself only as Salvatore. I can spontaneously communicate with art, which is my Basic Thought. I believe that it is important not to define some personalities. In your biography, you said that art helps you overcome various stages of life. Can you explain for the readers how exactly? In my life so far to every bad or tragic event I have responded with a pencil and paper, I pulled out my pain to heal my soul, I lived a very delicate moment at 19 due to a tumor or “alien” as writer Oriana Fallaci called it, and I remember drawing every second, during the chemo treatment. The art was essential to overcome that hard period in my life. Besides the pain, what else stimulates you creatively? The world, understood as a flow of images, my private life that I find an inexhaustible source of ideas and moods to express in an art form. Even good coffee sometimes and loneliness, be alone and listen to the chaos of life is almost a luxury, and what most of all stimulates me is the silence. However, working as an Art Director in communication, how much does a daily job affect your work process. Because in your pictures there is a precise and direct message. It has a lot of influence, I understand how to communicate it best, but sometimes it is the art that inspires me in communication, in my job. Could you tell me more about your childhood, and how it was your approach to art first. I developed verbal communication very late due to health problems, this made me start communicating with the world through pencil and paper, I fell in love for Warhol and Dali but the first art book I bought was Georgia O’Keeffe. Later I fell in love with Frida Kahlo and Basquiat because of their troubled life. How much of your personal experiences have influenced you ? My works are direct consequences of my personal experience, one of the last exhibition I’ve named “BADLY” and it cost me 4 years of work and refinement of the lines I wanted to trace through a graphic tablet. Instead of doing it with a pencil. The exhibition was autobiographical about my malaise of life, fortunately I am cured. Personally, I was very impressed with the strength of your collage works. The predominant anatomy, and the heart as a vital organ is often present. What does it mean? I am a person who is pushed far more by feeling than by thought. I did madness in the name of the art, it’s not just love, but I’ve followed it in general and although I’ve been often hurt I do not care, in the end I’ve already won . In your works famous characters play the part, there is a kind of celebration of their talent, I guess they are characters that you love very much. They almost seem like religious icons. Why? My artwork actually celebrate their lives, their image as the world’s icons. They are usually worshiped as saints, so I wanted to crown them and give an unusual environment where to admire them. I think getting to be an icon is the nicest thing that can happen, loving life and knowing to embrace their dark side. In this period of artistic confusion, how do you think that your art evolves? Art does not have a form or current to follow in my opinion and I am coming to such artistic freedom as not to ask this question. Hope to evolve, the most beautiful thing is change.